Last week’s workouts showed several different ways to use Excy, but our favorite workout was likely pedaling backwards with high resistance, which we explain below on just how good it can be for overall conditioning. We also explored the recumbent stationary exercise bike position, chair dips, bridge exercises and so much more! We also start easy, then workout way into a moderate routine and then finish with a 3 to 5 minute high intensity burst. We hope this is helping you keep those New Year’s Resolutions! Below is a snapshot all of the workouts for week four. This cycling workout focused on the stationary recumbent bike position at a higher intensity, including using cycling shoes. The Excy Mobile Coach Burst Play Workout was set for 45 seconds fast pedaling forwards; 15 seconds pedaling slow in reverse.You will sweat in this one for sure, so make sure to put a towel on your chair. Don’t forget, you can start easy and of course you don’t have to wear cycling shoes to enjoy Excy as a recumbent exercise bike from the couch. This is a great position to exercise while watching TV. This cycling workout was all about cycling chair designed to improve cardio, strength, and balance in a low-impact and high-intensity way. You can also start easy and transition to more intense exercise. We also jumped into the bridge exercise position, which is a resistance move that is popular with physical therapists as well as yoga and Pilates instructors because it’s simple yet strengthens your entire midsection. Add cycling a bridge exercise and it’s one tough move. This cycling workout embraces speed skater exercises, lunges, and hand cycling for a quick cardio and core workout. To do the speed skater exercises, from a normal standing position while holding onto the Excy hand cranks, take a big step out to the right. As you do, sweep your left leg behind you while hand cycling in front of you. Then, step to the left, bringing your right leg behind you and continue hand cycling. Continue alternating sides, building up speed, depending on your fitness level. Rest while doing lunges, then repeat. 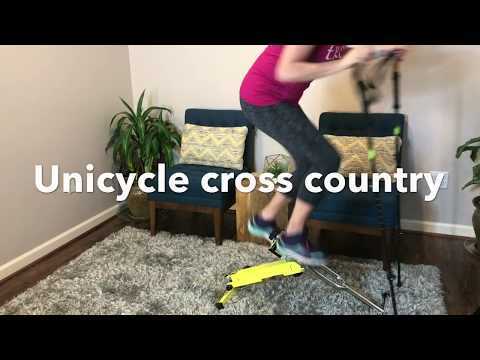 The unicycle cycling workout is tough, but adding step cycling and trekking polls make it even tougher, but it’s a great low impact exercise for your joints. It’s important to hold onto something, whether a doorframe, trekking polls, or even TRX bands. So much of the unicycling exercise motion with Excy comes from your abdominal muscles twisting and pushing your legs in one direction and your torso and shoulders in the other. This is a great core workout, but will also have your legs burning. Last, but not least! In fact, our favorite of the week. This workout focused on cranking the resistance up and pedaling backwards with Excy at a higher intensity. Fixed-gear bikes and flywheels can be hard, as well as risky, when riders quickly try rotate between pedaling backwards and forwards or suddenly stop while cycling backwards because it might put too much pressure on their knees and risk tears to the cartilage or meniscus. While it’s uncommon to ride backwards, pedaling backward on a stationary bike has been found to target the leg’s muscle groups differently. In fact, pedaling backwards on a stationary bike may be a more beneficial workout. Excy is as good as it gets when it comes to pedaling backwards. 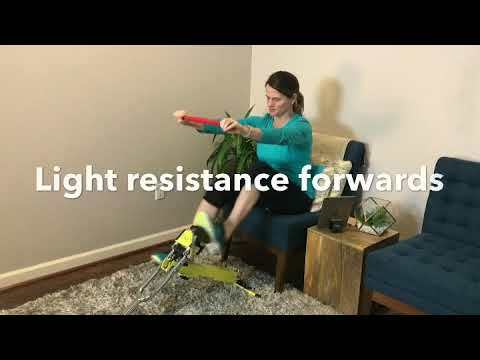 Not only can you crank up the resistance for strength training, but you can also easily transition between pedaling backwards and forwards without a sudden impact on joints. We will wrap up week 5 of the Excy full body cycling workouts this week! Always consult a doctor before starting a new exercise program. Explore our proper ergonomic setup videos to learn more about the positions.